Straight from the pages of my new cookbook due out in December, these vegan sausage rolls, my Easy-Peasy No-Sausage Rolls, combine earthy mushrooms, lentils and rosemary to create an authentic meaty bite. 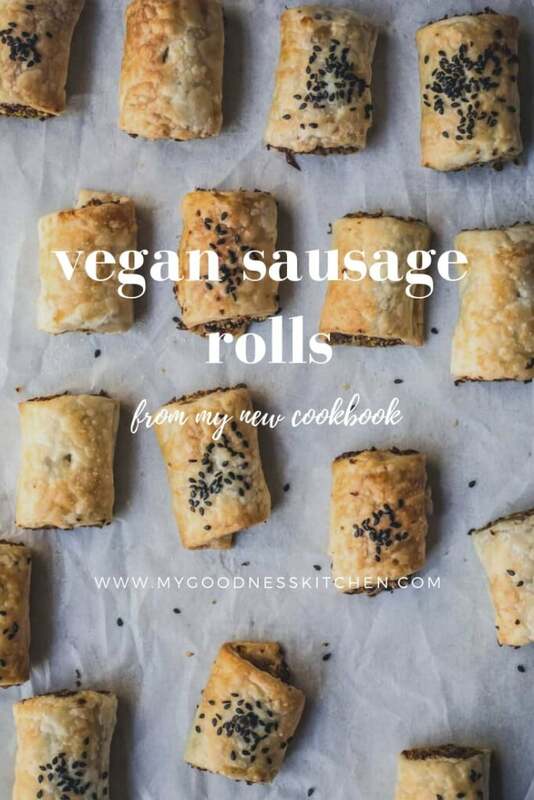 These vegan sausage rolls are probably one of the meatiest meat-free dishes I have created. So much so my four year-old didn’t notice the swap from her regular sausage rolls to this new meat-free version. Every Saturday morning my daughter has her karate class followed by a trip to our local bakery where she and my husband usually get a sausage roll each. I enjoy a quite half-hour watching other people eat things I can’t. Sometimes I drink tea, sometimes not. After months of this, I decided it was time to join the party. What makes these vegan sausage rolls so dang meaty? If you’re going to feed carnivores vegan food, creating meat-like dishes just makes things easier. These vegan sausage rolls combine earthy mushrooms, meaty lentils and rosemary to create an authentic, meaty bite. I serve them with my homemade ketchup and my little camper is a happy one. My cookbook “great vegan meals for the carnivorous family” is full of recipes designed to appeal to both vegans and omnivores. After many moons of cooking different meals to accommodate my family’s differing diets and tastes, I decided enough was enough. I began experimenting with omnivore-friendly vegan dishes. This cookbook is the result of years of trial and much error but I finally have a staple of dishes my whole family can eat. 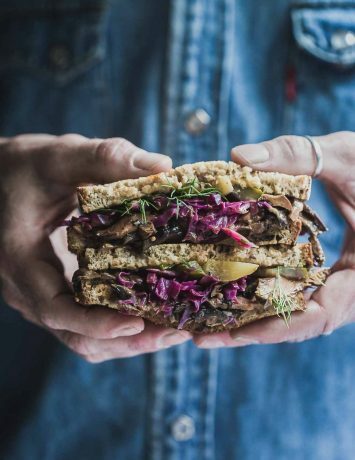 From vegan po’boys to dairy-free peanut butter and chocolate puddings and savoury French toast my book has all the bases covered. LIKE THIS VEGAN SAUSAGE ROLL RECIPE? TRY THE BOOK. 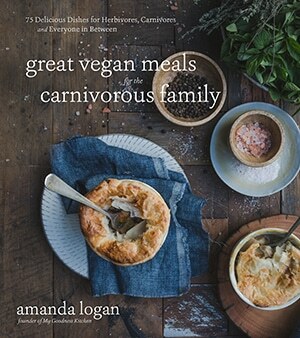 You can pre-order great vegan meals for the carnivorous family here. 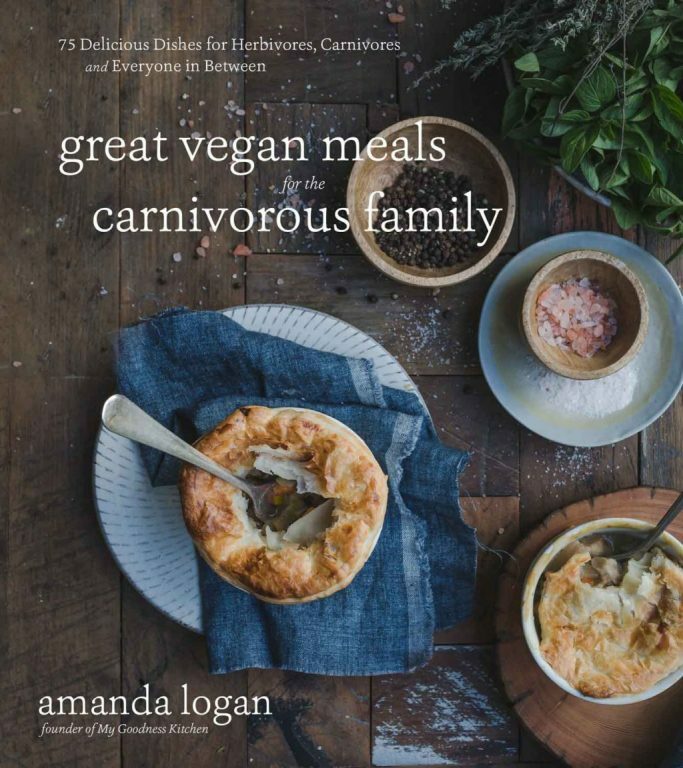 Great Vegan Meals for the Carnivorous Family. All rights reserved. No part of this book may be reproduced or used, in any form or by any means, electronically or mechanically, without prior permission in writing from the Publisher. Published by Page Street Publishing. Distributed by Macmillan. 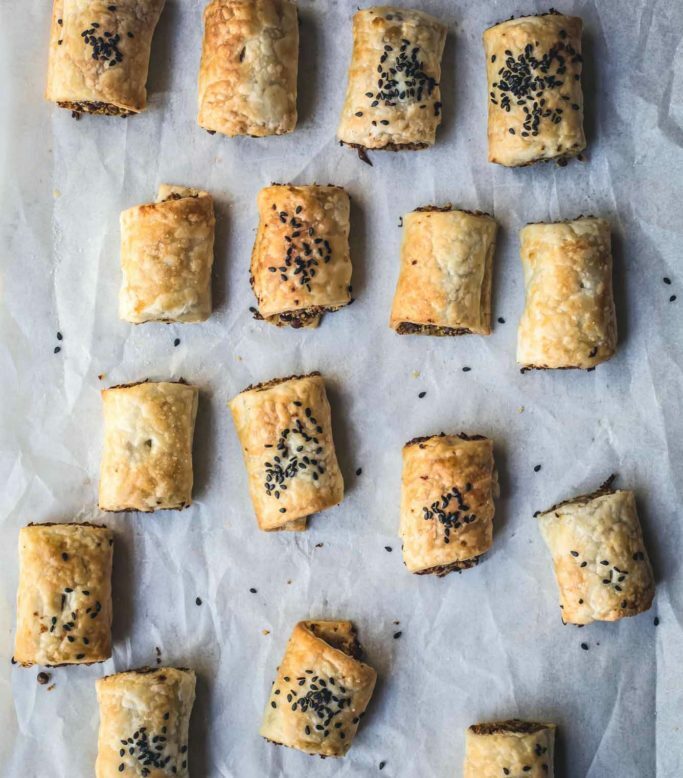 Straight from the pages of my new cookbook due out in December, these vegan sausage rolls, my Easy-Peasy No-Sausage Rolls combine earthy mushrooms, lentils and rosemary to create an authentic meaty bite. Heat the olive oil in a large pan over medium heat and add the onion, celery and carrot. Sauté for 5 minutes, then add the garlic and cook for another 3 minutes or until all the vegetables are tender. Add the chopped mushrooms and sauté for 2 minutes and then add the lentils, rosemary, Dijon mustard, nutritional yeast, red miso paste and apple cider vinegar. Cook the mixture down for 5 minutes, until most of the moisture has evaporated. Season with salt and pepper and add the chopped spinach. 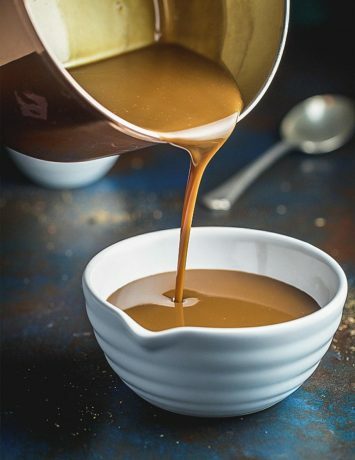 Remove the mixture from the heat and transfer it to a large bowl to cool completely to avoid soggy rolls. To prepare the sausage rolls, preheat the oven to 400°F (200°C) and line two baking trays with greaseproof paper. Remove the puff pastry from the freezer to thaw for 10 minutes. Stir the breadcrumbs into the “sausage” mixture. The mixture should hold together when squeezed; add some more breadcrumbs if needed. Slice the thawed pastry sheets in half lengthwise. Take one-half and lay it with the long side closest to you. 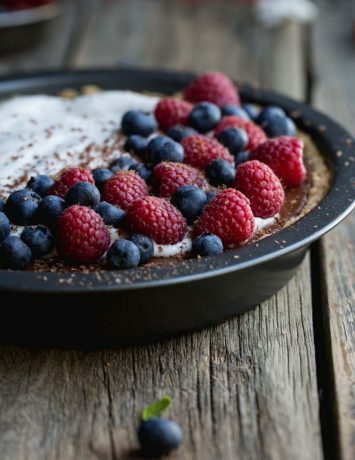 Wet the sides and the top edge of the pastry with water spoon 3 to 4 tablespoons (45 to 60 g) of the filling onto the pastry edge closest to you. Shape the filling into a log. Gently but firmly roll the pastry and filling away from you to form a large roll. Press the edges to seal. Slice the roll into 4 or 5 smaller rolls and make an incision into the top of each. Brush each roll with the dairy-free milk, sprinkle with sesame seeds andplace on the lined baking tray seam side down. Repeat with the remainingfilling and pastry. Bake the rolls in the oven for 15 to 20 minutes or until golden and puffed.